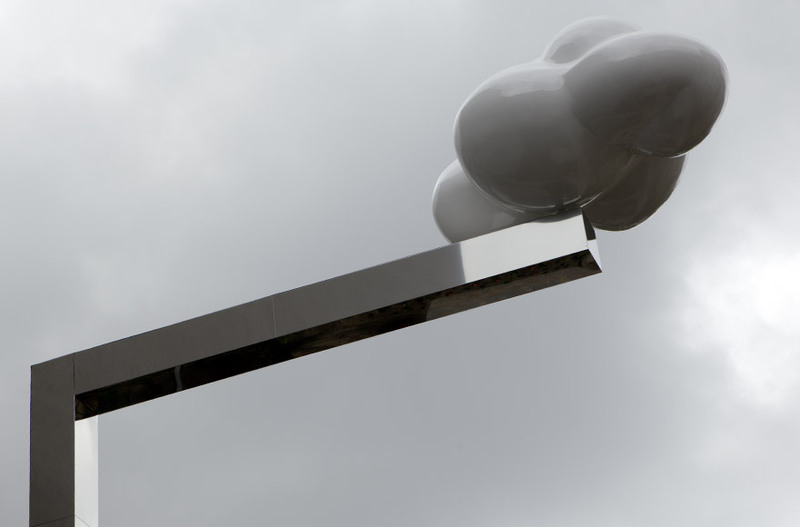 A stylised, shiny white cloud made from glass fibre rein­forced plastic, measuring 350 x 250 x 250 cm is mounted at the tip of an 11 m-high, swiv­el­ling, mirror-coated metal bracket with a 6 m cross­beam. Using a handle the bracket and the cloud can be swiv­elled by hand. 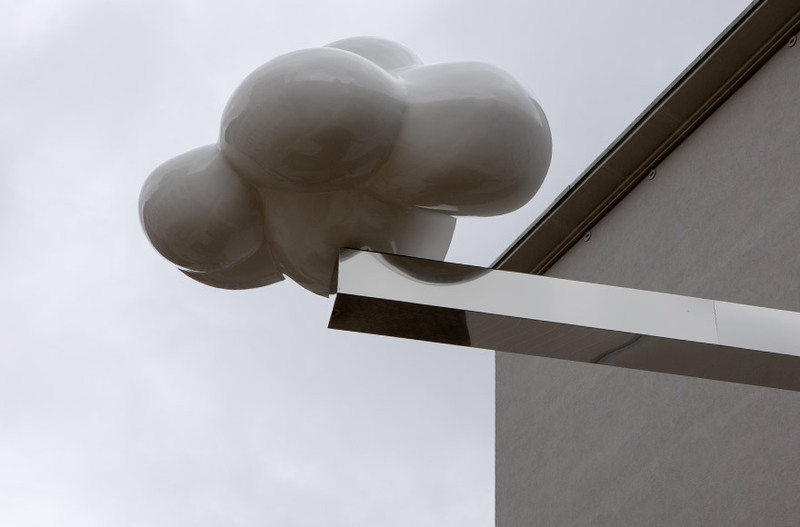 The manual posi­tion cannot be fixed, and the wind can change the posi­tion of the cloud in the garden’s airspace. The garden court­yard of the Ministry is surrounded by build­ings on all sides. It is made up of the two repre­sen­ta­tive admin­is­tra­tion build­ings, a six-storey ministry newbuild and a school building. The garden consists of strips of planting areas, resulting in a relief-like land­scape forma­tion. With the theme of a field-like struc­ture, a model land­scape was created which resem­bles aerial photographs of agri­cul­tural land. It is primarily a show garden for the ministry’s employees and is used occa­sion­ally for events. Similar to a show­case, the garden is looked at more than it is actu­ally used. In its air space floats the stylised cloud, thus reflecting the model-like nature of the garden’s design. The cloud was intro­duced into the sky above the minia­ture land­scape, as in a collage. 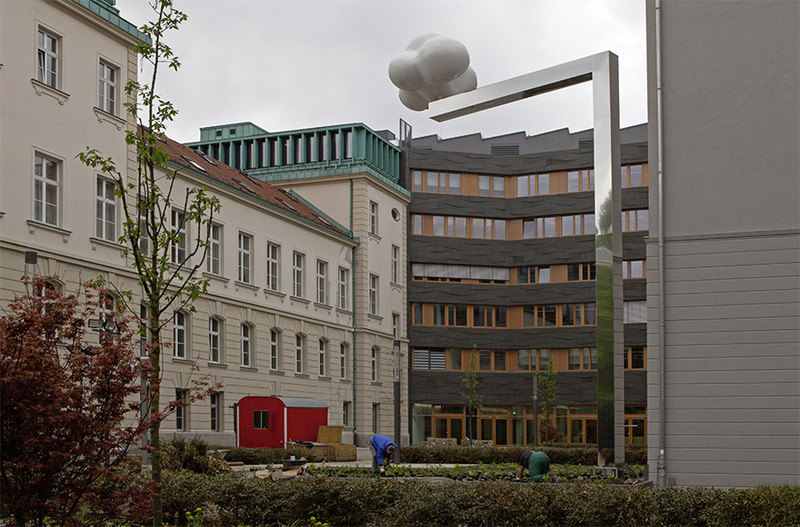 The sculp­ture turns the model-like land­scape of the court­yard into a model space. 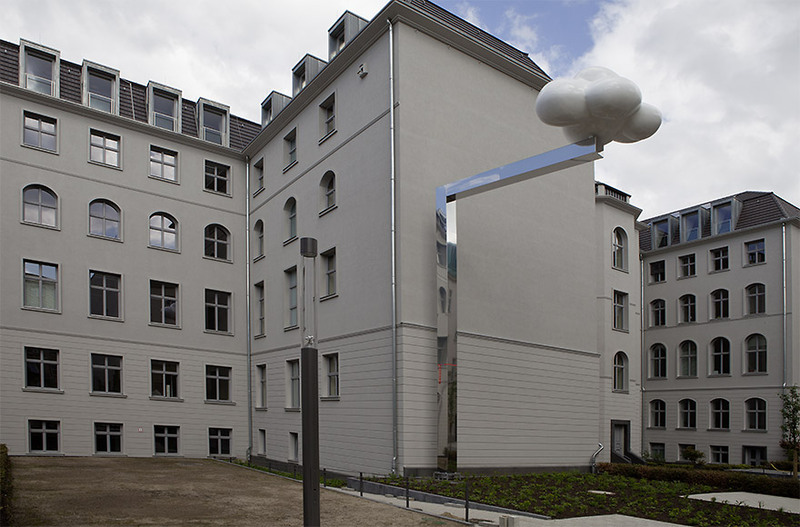 As the only actor in the sky above the garden court­yard, the cloud is extremely effec­tive in its promi­nent posi­tion: it swivels through an angle of about 200° around the edge of the building. The mirror coating of the mast reflects in its rota­tion the surrounding archi­tec­ture and land­scape.